When you hear the name NordicTrack…you automatically think treadmills. Why? Probably because, in its early days, NordicTrack revolutionized the treadmill industry with the now world-famous SpaceSaver® fold-away design. Today, NordicTrack continues that tradition of quality and innovation. Thanks to cutting-edge advances in cushioning, electronics and reliability, our treadmills have become the overwhelming choice of fitness enthusiasts throughout the world. Fortunately, we weren’t satisfied just producing the world’s finest treadmills. In recent years NordicTrack has unveiled a complete line of exercise bikes, elliptical machines, weight benches and more—all geared to provide the most effective workout available. Pushing the innovation envelope contributes to our success every year — the company holds nearly 223 issued patents and 107 patents pending. Knowing consumers want to "fit fitness into their home"; ICON invented the Space Saver folding feature for treadmills and ellipticals. Our patented FreeMotion Cable Cross has been revolutionary in shifting traditional strength training to functional fitness, with training for real-life and sport-specific movements. iFit Live powered by Google Maps is ICON’s fitness solution so consumers get better fitness results. ICON holds several certifications for quality. We are ISO 9001 certified, meeting the international standard of quality for manufacturers every year since 1994. ICON Fitness Europe was the first fitness equipment company to achieve the UNI EN ISO 9001 certification for its quality system, issued by DET NORSKE VERITAS. ICON is the first and only home fitness company to have TUV certification, an international product testing for safety, mechanical, and electrical standards. ICON is vertically integrated, therefore, in addition to manufacturing; ICON performs all research & development, industrial design, and marketing for its products. As one of the first U.S. fitness companies to venture into the international arena, ICON has R&D, manufacturing, and sales facilities located in Canada, China, and Europe, in addition to the United States. Our expertise in the home fitness market extends to the club and commercial market with FreeMotion Fitness. Facilities offering high performance training chose FreeMotion Fitness, including training centers for the U.S. Open, the French Open, U.S. Ski and Snowboard Team, the U. S. Olympic Training Center, the San Francisco 49ers, the Sydney football club, UFC gyms, professional and collegiate sports teams, and health clubs, hotels, and community centers around the world. ICON products have been featured on The Today Show, other TV news shows, and in many publications, including O, The Oprah Magazine, Consumer Reports, Men's Health, The New York Times, The Wall Street Journal, SELF, Prevention, Fitness, Men's Journal, Runner's World, Family Circle, Women's Health, Vogue, Home Gym, Shape, CNET.com, MSNBC.com, and thousands of newspapers and blogs. In 1977, Scott Watterson and Gary Stevenson, both business majors at Utah State University, founded Weslo, Inc. to finance their college education. The two started the company importing kitchenware, tableware, and marble products from the Far East. In 1979, Weslo, Inc. responded to the nation's energy conservation movement and acquired the rights to a freestanding wood-burning stove. The company began marketing the stoves under the trade name of Fire King, Inc. The company's entry into the health and fitness industry began with the manufacturing of trampolines. As they studied the exercise and fitness market, they were able to take advantage of the tremendous growth that occurred in the 1980s. Their entry into the fitness market proved to be timely as the product line expanded to include treadmills,exercise bikes, rowing machines, and home gyms under the name ProForm Fitness Products, Inc. As the company's exercise equipment business grew, the partners decided to spin off their wood burning stove business to focus on the fitness equipment industry. In 1988, Weider Health & Fitness acquired ProForm and Weslo. The 50-year-old company was, at the time, a large manufacturer of sport nutrition products, and the nation's largest publisher of health, fitness, and lifestyle magazines. In July of 1990, ProForm and Weslo moved into a new 300,000 square foot international headquarters. The facility houses state-of-the-art manufacturing and includes nearly all aspects of the company's operations - from research & development, assembly, customer service, and marketing. In November of 1994, Weider Health & Fitness sold the assets of ProForm Fitness Products, Inc. and Weslo, Inc. and Weider Care to a group led by Bain Capital, Inc. of Boston. The new name became ICON Health & Fitness, Inc.
HealthRider, a leading marketer of riders was purchased in August of 1996. This acquisition provided another strong name to the ICON family, and allowed the company to expand its sales through its own chain of retail stores located across the country. In 1999, ICON acquired the NordicTrack brand and developed it into the premium line of home fitness equipment. In 2001, ICON has expanded into the commercial and specialty fitness markets with the acquisition of FreeMotion Fitness, Inc.
NordicTrack is proud to to help preserve our natural environment with its involvement with EcoFit. 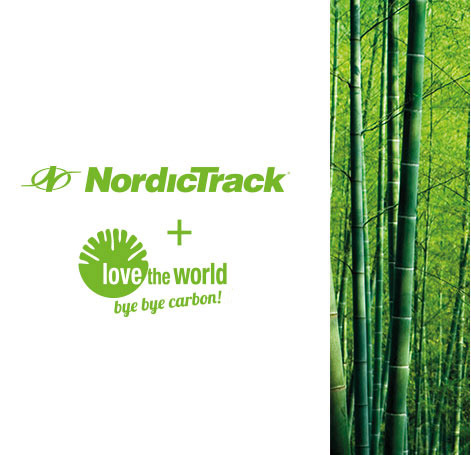 Since May 2011, NordicTrack has embarked on a project of reduction and offsetting the CO2 emissions generated by the development, production, transportation and use of the brand. When you choose your fitness equipment, make sure you 'Love the World' with NordicTrack.